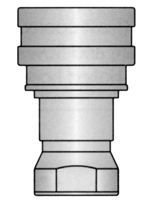 Sizes 1¼", 1½", 2", 2½", and 3" coupler parts B, C, D, and DC are supplied with a locking feature. Safety pins may be inserted to make locking handles to prevent disconnection during product transfer. Coupler parts B, C, D, and DC are supplied with Stainless Steel handles. Use safety clips provided in handles to make locking handle. NPT/Hose Sizes: From 3/4" to 6"
Available Sizes: From 3/4" to 5"
Specially designed as a quick acting coupler to fit over .065 aluminum tubing for dry pneumatic systems only, creating a full flow system minimizing material build-up. The rubber gasket in the nut compresses around the aluminum tubing and forms a seal when it is firmly tightened. Our SH Series Tigerflex PVC suction hoses that are fitted with a part "C" or "E" can be attached to the pneumatic conveying system that is fitted with a part "BC" or "FC". Also available for use with Schedule 40 pipe. Call for pricing. Available Sizes: 1-1/2", 2", 2-1/2", 3"
Pipe Sizes: From 1-1/2" to 6"
NPT/Body Sizes: From 1/8" to 1-1/2"
NPT Thread Sizes: From 3/4" to 2"
Hose I.D. 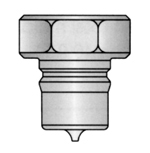 Sizes: 3/4", 1"
NPT Thread Sizes: From 3/4" to 1-1/2"